Get ready for another zombie-fueled emotional roller coaster in fall 2013. 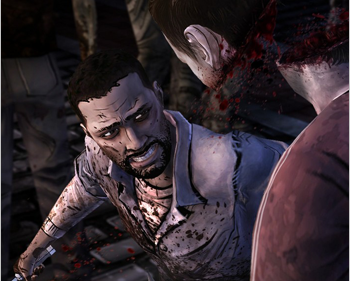 Telltale Games' The Walking Dead has been a highly successful venture; its depiction of how everyday people struggle in a world infested with zombies has earned it several awards and nominations. We've already learned that a second season of episodic content was on the horizon well before the first season was even finished, but now there's an end date in sight: season two of The Walking Dead is planned for a fall 2013 release. Telltale CEO Dan Connors originally stated that the company was "aiming for fall of next year" for its release, but Game Informer clarified the date by obtaining the following comment: "The current estimated release window for Season Two of The Walking Dead is for fall of 'this' year (2013), and not 'next' year (2014) as has been reported after a recent interview. We apologize for any confusion and thank you and all of our fans for your continued excitement for Telltale's series." In the meantime, fans of the series can eventually look forward to some additional Walking Dead content in the interim, according to story consultant Gary Whitta. He recently said that "there may very well be more Walking Dead from Telltale before season two", although he kept quiet on what that content would actually be. The game is still enjoying the fruits of a successful release, recently picking up a couple of BAFTA awards in the Story and Mobile & Handheld categories.